On a whim, Linda and gendomike decided to review one of the Winter 2012’s best anime, Ano Natsu de Matteru (Waiting in the Summer) together. Here’s the result. Please note that this review contains major spoilers for Ano Natsu and some for Onegai Teacher. You have been warned. Linda: Ano Natsu de Matteru didn’t end the way Onegai Teacher did, and Onegai Teacher had been one of my top titles when I was in college a couple of years ago. But Ano Natsu had a bittersweet ending that made me rethink the romance novels I read with their happy endings. Finding an ideal companion is not easy, but I mentally saluted Kaitou-kun’s bravery for facing up with his feelings. Carpe Diem or Seize the Day! Shouldn’t it be as easy and straightforward to find an ideal companion as Kaitou did with Ichika? But that is a dream for many seems impossible. Kanna, as much as I try to ignore her character, did fill a role that many people might feel. In trying to find the ideal companion, she found it in Kaitou, but since Kaitou was in love with Ichika, she had to back away. Then the situation with Tetsuro came out very unexpectedly with Mio also liking him. So in the end, Kanna was left alone and how she accepted it, is quite realistic and mature. It is sad for those “happily ever after” fans, but realistically speaking this seems to be a role that I noticed a lot in my own life and of others I observed. gendomike: While the relationship between Kai and Ichika really is idealized, I think what moved me more was what happened to everyone else. A lot of the emotional heft was really carried by their friends who are left out by the main couple—Kanna especially, to whom I dedicated my Valentine’s Day article. This show does the angst and confusion of first love really well on the whole. Still, real relationships are definitely more complicated than this show makes it out to be! There’s just enough realism, though, to make the show just a little more bitter as well, as sweet. The pain on their faces and in their suppressed emotions—which eventually do come out—is real. The show respects those feelings as much as it brings the destined pair together in a well-directed way. In that it is following in the footsteps of its great predecessors, Honey and Clover and Toradora! The jilted get their say too. Finding that ideal companion is not going to be easy, when the world is filled with superficial events. But as for scenes of love fulfilled I feel that this scene on the train is a great one. Trains fill my everyday living, since I live in New York City. When two people sit side by side and you know them, it makes for a good conversation, or just a trip waiting for the final destination. Being stuck in an iron car is just that. The final destination that Kai and Ichika made was to the place in Ichika’s memory of earth. I kept on thinking about was Lake Kizaki in Nagano Prefecture, the place that was the inspiration for Onegai Teacher and Onegai Twins. The part where the tree disintegrated made me think “Oh no!” But still the part also makes me wonder is the animators trying to connect and finally conclude the ending of Onegai Teacher? I think I teared up at that part. It is Lake Kizaki! That was on purpose, to connect it directly with the earlier series. This is Yousuke Kuroda writing it, after all. This train scene was the best part of the final episode, which I otherwise found rather odd and somewhat unsatisfying. The sharp genre shift of the last two episodes was, admittedly, not entirely unhinted at, but the show was at its best as an emotionally nuanced teenage love drama, not a sci-fi chase series complete with actual Men In Black. Of course, Ichika’s alien-ness was going to have to come back at some point, given the show’s premise and its connection to the original Onegai Teacher series. I’m not sure they could have done any better in fact without cutting ties to that completely. But it was nice to see two people who actually love each other and can say so out loud in anime. That happens far too rarely. The character of Remon stood out for me. I think lots of other people like her. The truth of her being MiB seemed kinda fishy for me, but the shot of her in this last episode scene I really liked. She is what I believe to be the conscious adult in a group of teenagers. In spite of her pretending to be the same age as Ichika, I imagine she is the adult that adults aspire to be in real life. Someone of use and has life experiences that can be a role model to others. Remon was both a very amusing presence and also a problem for the story. She had some of the sharpest one-liners, but she wasn’t really that much of a character than a plot device to help the other characters along. By the end it’s clear she is meant to be the same person as Ichigo from the previous Onegai series: a loli who is much older than she looks, who is sarcastic and clever, and likes to mastermind events behind the scenes. She’s even played by the same voice actress as Ichigo, Yukari Tamura, and does the otaku in-joke of being “forever 17.” (She and Kikuko Inoue—who played the Teacher in Onegai Teacher—have been saying that line for years.) In other words, Remon is basically a gimmick—albeit a very entertaining one. Getting everyone drunk and giving Kai and Ichika a condom were some of the show’s highlights! I wasn’t sure when I was watching the ending: did Ichika come back, or did they photoshop her wearing the outfit that Kai’s sister got for her? (Ano Natsu showed off a lot of the older sister characters, for both Kai and Tetsuro, and Mike and I talked in chat about how the older sister is used as a parental substitute in anime a lot lately.) So Ano Natsu might appeal to young adults watching this series the same way that I thought with Onegai Teacher. Certainly in young adult literature, the parent figure is always absent. 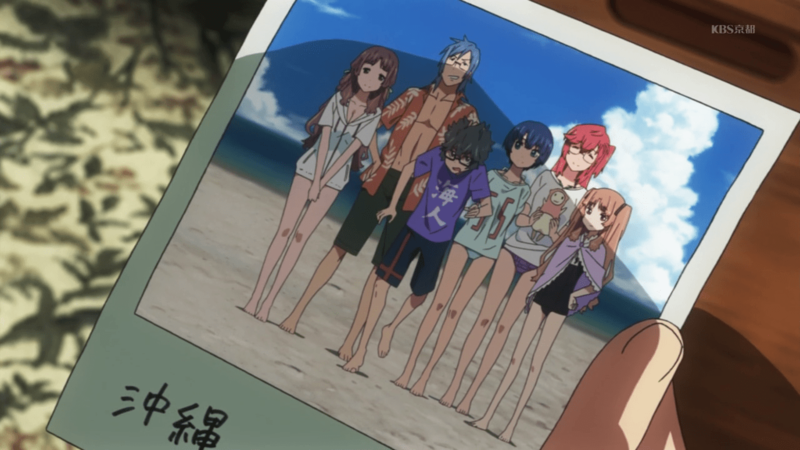 In real life that is not the case, so one aspect that stood for me in this series as with other anime series is how much friends can be acquired like family members. I see that in real life with my younger friends. I find that as I grow older with personal friends moving into new relationships that it changes dynamics, but Ano Natsu shows a possibility of one summer. Ichika definitely came back. When Remon is back at MIB HQ, you see her pull up a diagram of Ichika’s ship and start playing with it. She basically hacks the spaceship so it would crash land and come back for Kai—and we know the film shot was after all that happened, because she’s wearing the poncho. Personally, I felt Ichika’s return was a cop-out. The series had built up a lot of emotional capital by playing upon the idea that this teenage summer romance was a fleeting, though beautiful, experience, filled with bittersweet memories and realizations. The monologues really traded on it. It did a really good job in evoking what the memory of summer flings of that sort are like. I had similar experiences at that age, and I wrote about them earlier. Even the final episode kept you hanging on the idea that it was over. It would have been braver had they left it at that rather than bring her back like that at the very last second. I really like that insight there—that friends can become like family, especially in their absence. The way the main friends interacted was very family-like, and there were all kinds of allusions to that. Kanna sees Tetsuro as a little brother; Kai calls himself a little brother in relation to his sempai, Ichika, and seems to see Kanna as a sister too. (Unfortunately for her.) But more importantly the show really captured just how the way a group of teenage friends interact will start to change once romance starts getting into the picture—and it can be a wrenching change. All of the main leads have to come to painful emotional resolutions and be honest with themselves and others to move on. That was the most powerful part of the show and the thing I will remember most. That, and the ED, “Vidro Moyou.” The ED and the leadups to it were a big highlight of the show. Tatsuyuki Nagai, the director, has always had a knack for picking songs that fit the shows he works on thematically, from Honey and Clover II, Toradora! and Ano Hana. And he always chose the right moment to end each episode, so that watching it every week was always an emotionally satisfying experience. At least until the end. What I liked about the ending was how well the images fit with the song, with Kai and his friends in a circle always seeking together, and with Ichika holding her spaceship out like a toy. With the color outlines, it makes for an interesting visual experience. Seeing Mike and MLM enjoy this series as much as they blogged about it on AD encouraged me to watch it, even though I was afraid it was going to fail or not live up to its legacy as an Onegai Teacher follow up. For the most part, I was entertained by this anime series, and definitely liked the ED well enough to put it on repeat at moments. But in comparison to Onegai Teacher, I still feel the earlier title is much more emotionally meaningful to me. Probably in some ways I aspire to have a relationship like Kei and Mizuho or Kai and Ichika. Hence this companionship seeking is something I am realizing I need as I grow older. The tie-in to Men in Black, with the Men in Black 3 movie coming out soon, makes me wonder just how much of a paradox or cross-industry relevance is there. Cheesy as it might sound, when I hear of “No Borders” by Japanese musicians, perhaps this is a sign for me to watch MiB 3. As of now, I am personally unsure of what anime series to try and watch, but I am seeing the excitement of Mike for Kids on the Slope. Perhaps that is the next series for me to watch. Onegai Teacher was one of my favorite romance series from the beginning of my fandom. It had an emotional honesty to it that was rare in most anime romance at that time, and I remember saying hyperbolically that “this is the reason I watch anime” when I finished it…so when I heard that Ano Natsu was going to feature the same screenwriter, but with the team of Honey and Clover and Toradora! behind it, I was excited. And for the most part, I was not disappointed. 80% of this show is very good to excellent, from the smooth directing, the emotionally resonant writing, and what I would say is actually improved character dynamics compared to the old series. The ending was a bit of a letdown and a departure, I felt, from the show’s strengths, but it was hardly enough to ruin everything. From the transition of the last scene to the credits, to the excellent voice acting (especially for newcomer seiyuu Kaori Ishihara as Kanna), to the sense of genuine youth experience animating the story, this was one of the winners of the winter 2012 season. I’ve been to Nagano only once, and yes, it was like this scene, very idyllic countryside. Yes, Lake Kizaki was also featured in Tora-san series, 29th film, Ajisai romance. By the way, Ajisai is the plant that Rea from Sankarea eats, poisonous leaves. Oh yes. 17 years old cult members were there. Yukarin, and at last, it finished with Kikuko’s narration! I like Ichika wearing a catholic veil. Yes, I also liked Onegai Teacher. Young Teacher, the subject of school boy’s fantasy. Now, it’s senpai. For Onegai teacher, I loved the center characters, but for AnoNatsu, I love the side characters better than the main protagonists. Kanna, Tesurou, Mio. I think these characters were more appealing to me. Tetsuro is too nice, yes, he surely is a feminist gentleman! Yes, Sakamichi is very cool. AnoNatsu was about filmmaking, but Sakamich is about jazz. And in Nagasaki, the well known catholic city in Japan! I really want to visit Nagasaki!